pop artist Romero Britto; and features his signature bold patterns and vibrant colors. It’s fun, upbeat and adorable. Mickey Mouse wears a happy and optimistic expression on his face which mirrors the optimism in the vibrant colors. It’s amazing how the many details, colors and patterns in this conversation piece blended so well. Paired elements on the left and right sides have different colors and patterns. Mickey’s gloves are white on one hand and yellow on the other. The patterns, too, are different. Look at his ears, they’re not the same pattern and color, yet they match. The top back portion of the head with the ears forms the lid. If you own this I doubt you’d use it as a cookie jar. If I had it I’d display it on a cabinet or shelf with glass. It’s more expensive than most kitchen appliances; you’d want to protect it from falling and breaking. It’s hand-painted in colorful dolomite. Size is approximately 11-1/2 inches x 9 inches x 11 inches. Only 2,000 pieces of this item is made worldwide. Each piece is hand-numbered and accompanied with a certificate of authenticity. Truly a collectible item. But if you can’t get your hands on one of these rare pieces there are other beautiful and uniquely crafted Mickey Mouse jars for cookies. Some are both functional and decorative. They are great gift options for a Mickey Mouse fan and for a collector even if they are not rare or vintage items. 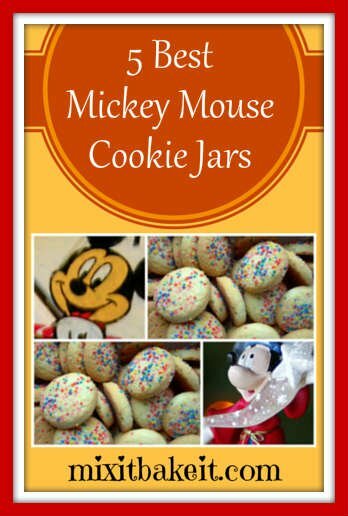 Click to see more choices of cute Mickey Mouse cookie jars. My sister has several Mickey Mouse cookie jars sitting snugly on her display cabinet. They are so charming. If I had them, I, too, won’t mind if they serve no other purpose other than to brighten up my dining area or kitchen counter. Cookie Jars: Functional or Collectible? This hugging Mickey and Minnie mouse cookie jar is so cute you’ll be tempted to grab it if you are a fan of these Disney characters. They look so loving, they’ll make you smile. Kids and adults love it. The characters wear the traditional red, black and white outfits. Minnie dons her trademark white polka-dotted red bow. It’s great for gatherings when kids are coming over, they’ll finish-off the cookies fast. But it’s not practical for storing cookies because the lid is not sealed. But it is an attractive decorative piece and a lovely present on birthdays and Christmas. Click on the image to see more information for choice of Mickey Mouse jar. This cookie storage is an innovative take on the well-loved Disney creation. It’s Mickey’s pants with Mickey feet and ears. The ear assembly is the jar cover. The attractive red color of the jar contrasts with the black lid. Mickey’s eyes are two white oval shapes pasted on the red background. This is big compared to other Mickey Mouse cookie jars. You can fit a whole bag of cookies into it. It’s easy to clean because there is less details in the construction. Hand wash to preserve the glossy finish. It’s made of ceramic and the lid is not tightly fitted, so don’t leave the kids alone with it. Zac Designs has re-launched the Treasure Craft brand, which it now owns, with timeless characters from children’s classics. This jar features a sitting Mickey with over-sized yellow shoes and spindly folded knees. His left cheek rests on his left hand and his elbow rests on his knee. His mouth is half open and he seems to be thinking or wondering at something. His right hand is on the floor. Mickey is wearing traditional contrasting and attractive colors. His face is pure white and his nose protrudes. This is a large 12-inch cookie jar made of strong ceramic and hand-painted dolomite. It is a functional, decorative and collectible Mickey Mouse jar for treats. This gift box cookie jar has sculptured Mickey and Minnie figurines atop the lid. The pair is wearing bright red and black outfits. Minnie has matching bright red over-sized bow and Mickey wears white gloves. The square receptacle is adorned with stripes of red and white and a huge deep green ribbon ties around it. This is a functional cookie jar. A soft rubberized gasket on the lid snugly holds it on the jar. Great for holiday gift-giving or as decoration. Generally, people buy cookie jars to store cookies, candies, chocolates, etc. But Mickey Mouse cookie jars are sought mostly for its collectible value. They have also become sought-after as gifts. Rare and retired designs are even more expensive. I understand why some folks delight in collecting these pieces. My sister’s collection is so engaging and entertaining. And over time rare pieces will appreciate in value. There are less expensive designs, too, if you are after this for functionality whilst adding color to your space. But they are still more expensive compared to other cookie jars. Well, Mickey Mouse is probably the most popular Disney creation, a timeless classic character. He has outlived generations of fans. Therein lies the value of anything that carries his name.